Ed Moses (born 1926 in Long Beach) has been a prominent figure in the Los Angeles art scene for almost 60 years. He first exhibited in 1949, and was part of the original group of artists from the Ferus Gallery in 1957. Moses’ career was the subject of a major retrospective at the Museum of Contemporary Art in 1996, and his art was featured in the Pompidou Center’s survey exhibition ''Los Angeles: Birth of an Artistic Capital, 1955-1985'' in Paris. Always working with process and experimenting with materials as a painter, Moses has been critically lauded for his bold composition and innovation. At over 80 years old, he remains a prolific fixture of the Los Angeles art scene, and is respected for his inventiveness as an artist and his attentiveness to new developments in contemporary art. 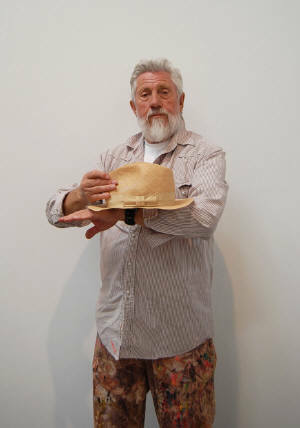 The artwork of Ed Moses has appeared in exhibitions around the world, and his pieces are included in the collections of the Los Angeles County Museum of Art, The Art Institute of Chicago, the Menil Foundation, the Museum of Modern Art, The Corcoran Gallery of Art, the Philadelphia Museum of Art and the Whitney Museum of American Art, among others.